> Research Library > Virgin Pulse > Reduce Healthcare Costs: How can you Move it AND Lose it! Reduce Healthcare Costs: How can you Move it AND Lose it! In a new twist on an old saying, the simple idea of “move it and lose it” is finally starting to turn employers into believers. 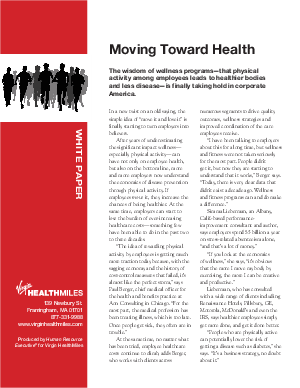 After years of underestimating the significant impact physical activity can have, not only on employee health, but also on the bottom line, more and more employers now understand the economics of disease prevention through physical activity. If employees move it, they increase the chances of being healthier. At the same time, employers can start to lose the burden of ever-increasing healthcare costs—something few have been able to do in the past two to three decades.